If you’re thinking that the photo above looks very familiar, you’re right. Tim reviewed the Buffalo TeraStation Pro Quad. (TS-QVH4.0TL/R6) last year. That device, like so many other NAS products on the market, is Linux based and manged via a traditional web-browser interface. Fast-forward a few months and now we have the Pro Quad WSS, a NAS based on Windows Storage Server 2008R2 Workgroup Edition. Not only do the two devices share a common case, the internal hardware is also virtually identical in both models. So if the hardware details are important to you, be sure to visit the link above. Tim has already covered the Pro Quad WSS' hardware details and performance testing. So this review will cover the feature set along with a drive pull test. With so many products in their product line, sometimes it’s difficult to get determine the differences. Fortunately, Buffalo has a comparison chart, shown in Figure 1, that helps distinguish the products. The two models enclosed in the red box are the ones we’ve been talking about. The Pro Quad WSS is targeted at a very different market than the Linux-based Pro Quad, or, for that matter, the recently reviewed Western Digital DX4000 Sentinel. The Pro Quad WSS is intended for small-to-medium-sized businesses that have a Microsoft networking infrastructure, and preferably, an IT professional familiar with Microsoft Server products. Since the Pro Quad WSS is running the Workgroup version of Windows Server 2008R2, it can integrate seamlessly into an existing Active Directory windows environment with full OU support. Linux-based NAS products with Active Directory support often don’t fully support all of the features of Active Directory. As Tim indicated, the Pro Quad WSS is running a plain vanilla version of Windows Storage Server 2008R2 workgroup edition. In fact, Buffalo has a link on its site to Microsoft’s datasheet for the Storage Server product line that you might find useful. By comparison, the Essentials version of Windows Storage Server that ships with the Western Digital DX4000 is more focused on the smaller office or home environment. It includes media streaming services, a health monitor, PC backup, a friendlier server manager interface, and is limited to 25 users. Through a special arrangement with Microsoft, Buffalo has negotiated a license that covers 50 concurrent users as compared to the normal 25 users covered by the regular version of WSS workgroup edition. Windows Storage Server 2008R2 running on the Pro Quad WSS also has full support for both iSCSI target and iSCSI initiator. 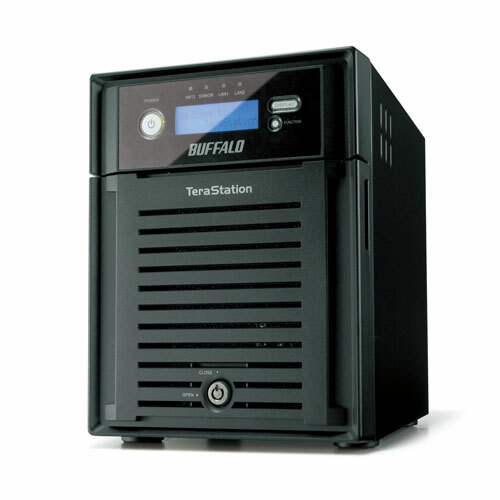 While not explicitly covered in this review, Buffalo’s WSS-based rack-mounted TeraStation Pro products (WS-RVL/R5 4 and 8 TB models and WS-bVL/R5 6 and 12 TB models) ship with Windows Storage Server Standard version. In addition to the features included in WSS Workgroup, WSS Standard supports unlimited remote connections, networking services including DHCP Server, DNS server, a read-only domain controller, and data deduplication using Single Instance Storage technology.